What is... NO SHAME GOES TO WAR? 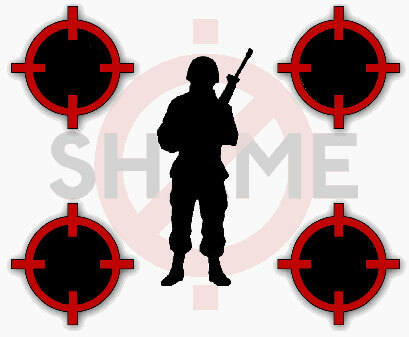 NO SHAME GOES TO WAR? NO SHAME GOES TO WAR sprang from a series of conversations between No Shame Theatres on the East and West Coasts about the high quality and frequency with which No Shame participants throughout the country were using their open venues to deal with September 11th, the War on Terrorism, and the impending invasion of Iraq. It was agreed that these remarkable expressions of collective rage, confusion, sorrow, and fear deserved to reach a broader audience, so a campaign was launched to gather together and exchange these scripts in order to make them available to performers in every city. A special "No Shame Goes To War!" show was announced for Los Angeles on Saturday, March 8th in order to kick off the nationwide project with performances of No Shame pieces from all over the world. Contact No Shame Theatre in your area for information about any local events they may be considering. No Shame Theatre is a forum for theatrical experimentation where anyone with a 3 minute script and a dare-to-fail attitude can take the stage in a show that is raw, unrehearsed, and always unexpected.